I know it's time to write up my end of the year post but first I wanted to mention one more book for the year, one I just finished reading today even though I was fighting a heinous headache. I just couldn't put this one down for any reason. 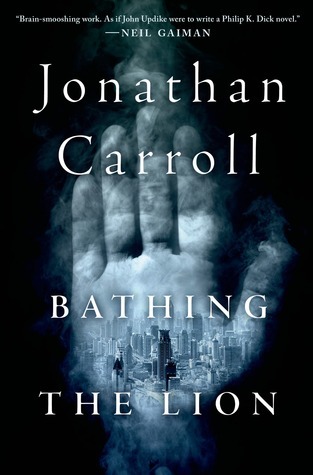 Bathing the Lion by Jonathan Carroll is another gem from this not-well-enough-known author. It is science fiction turned on its head, a thoughtful musing on what our value is as human beings. I don't want to get too into the plot because the unfolding is beautiful so I'll just say that it starts with one set of truths and then turns those on their heads and applies an entirely different set of rules and facts. The blurb on the back from Neil Gaiman says "[BTL] is a departure for Jonathan Carroll" but I humbly beg to differ. 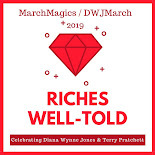 The three Carroll books I have now read have one thing in common -- they allow readers a complete escape whilst simultaneously exploring the deepest truths of humanity and relationships. In fact, I was having a Carroll-esque dream last night when who should appear but Gaiman (and his adorable son, Ash), whom I chastised for his blurb. I apparently felt quite strongly about this! I just have one more Carroll book on my TBR so my next mission will be to seek out copies of some of his other books -- and to dive into rereads, of course. Not an author I've read before, but his books sound unique and interesting.